For the record, my favorite blogger is Bob Collins. 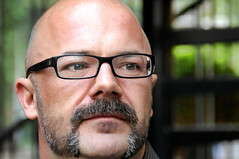 But close upon Collins’ heels comes Andrew Sullivan, who more or less invented the modern political blog. If you don’t read him, you should. Three reasons: He is ideologically unpredictable; he is tireless, and he always addresses the hot topic of the day. Two more: He’s a brilliant intellect and a wonderful writer. And a final one, maybe the most significant: He is a truly principled human. So it’s nervous-making to see that in April he’s leaving his place on the Atlantic’s roster of bloggers and taking his Daily Dish to the Newsweek/Daily Beast conglomerate. Maybe it’s nothing to worry about, as Andrew assured his followers Sunday. Beastweek editor Tina Brown calls him a “natural soul mate” of her enterprise, on account of his “fearlessness and doggedness.” Well, good luck to them both. And a special plea to Brown: This particular dog is indeed fearless, but he’s also Best in Show. Please don’t mess with him. Newer › How will you deal with the rising price of gas? The one thing that’s always bugged me about Sullivan was his defense of “The Bell Curve”. I had no doubt that he wanted bigger and better things, but his job as editor of the New Republic will forever be a stain on his objectivity.